It is Spring Break at my house, though the weather is anything BUT Spring-like. Brrrr….! We started our tree taps last week, but a cold snap has come through. It’s okay, though, as it looks as if things will be thawing a bit at the end of the week. The chilly weather plus my kiddos being home means we will be baking plenty of fun this week. So far we have made pancake pie and pizza pie for Pi Day, a shamrock surprise pound cake and this week we are going to see what we can bake up and pop in the freezer for Easter. I love that my kids like to play in the kitchen! 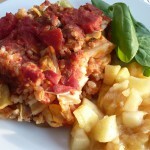 Heather of Celiac Family is hosting the Gluten Free Menu Swap this week. She picked carrots as the theme. I will be serving Morning Glory Muffins and Carrot Cake Pancakes for breakfasts this week, both of which contain shredded carrot love. I use carrots a lot in both savory and sweet recipes. They are easy to grow in my raised garden beds and such nice keepers after harvesting. I like to sprinkle shredded carrots on my Dairy Free Seven Layer Dip, mix them into Kimchi, Chicken & Veggie Nuggets, and add them to Freezer Smoothies with Veggies, Apple, Bok Choy & Carrot Slaw and Mongolian Chicken. Yum! How do you serve carrots? The week’s breakfast options: Morning Glory Muffins, Carrot Cake Pancakes, eggs and various fruits. The week’s lunch options: Nut butter or roasted chicken sandwiches on Gluten Free Swedish “Rye” Bread, Pizza Muffins, and various fruits and veggie sticks. Grocery List for this week’s dinner menu. For the freezer: Make a double batch of Bacon Spinach Quiche Pie, one for dinner and one for the freezer. 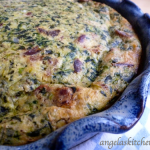 Allow second quiche to cool while eating dinner. When cool, wrap well, removing as much air as possible, seal, label and freeze. For the freezer: Make a double batch of Easy Taco Bake. Wrap the second pan well, removing as much air as possible, seal, label and freeze. It all looks so good! 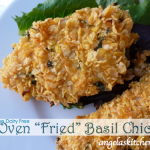 I love how crispy the basil chicken looks. I definitely need to give that a try.